Egypt's main opposition group backs calls to oust the ruling Islamists after deadly clashes erupt throughout the country. Egypt's main opposition group on Saturday backed calls to oust the ruling Islamists after deadly clashes, as President Mohammed Morsi scrambled to contain fallout from footage of apparent police brutality, AFP reported. According to the report, the National Salvation Front said it "completely sides with the people and its active forces' calls to topple the authoritarian regime and the Muslim Brotherhood's control." The NSF also demanded that Morsi be prosecuted for "killings and torture," while urging Egyptians to stage peaceful protests. It said Morsi should be put on trial after an "impartial investigation" and ruled out dialogue with the presidency until "the bloodletting stops and those responsible for it are held accountable." Clashes on Friday night between protesters and police outside the presidential palace left one dead, and police were filmed beating and dragging off a naked man. The beating was "an inhumane spectacle ... no less ugly than the killings of martyrs, which is considered a continuation of the security force's program of excessive force," the NSF said, according to AFP. Interior Minister Mohammed Ibrahim's office said he had ordered a probe to "hold accountable" those responsible and that he would resign if "that's what the people want." The presidency said it was "pained by the shocking footage of some policemen treating a protester in a manner that does not accord with human dignity and human rights" and would follow the ministry's investigation of an "isolated act." Prosecutors say the man, a 50-year-old construction painter sent to a police hospital, was found carrying petrol bombs. In Friday's clashes, a 23-year-old was shot dead and 91 people were injured, a medic said, and the interior ministry said 15 of its men were wounded by birdshot. In central Cairo's iconic Tahrir Square, protesters threw stones and bottles at Prime Minister Hisham Qandil's motorcade on Saturday morning, the Egyptian Dream Live television reported. The presidency has said security forces would deal with violent protests with "utmost decisiveness" and that it would hold opposition groups found to have incited deadly clashes as "politically accountable." 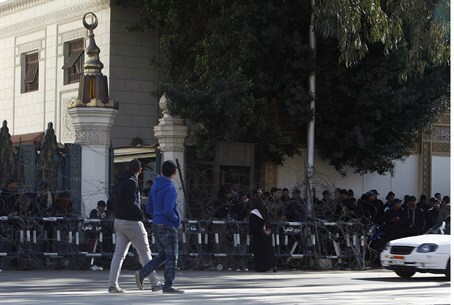 Morsi's Facebook page said the protesters had initiated Friday's violence by trying to break into the palace. On Saturday night, several hundred mostly young protesters again gathered outside the palace and were throwing rocks and Molotov cocktails at the compound's walls, AFP reported. The opposition, which accuses Morsi of betraying the revolution that toppled Mubarak two years ago, has distanced itself from the violence and urged demonstrators to exercise "utmost restraint." The NSF had joined rival Islamists on Thursday in condemning violence and supporting efforts for a national dialogue, but insisted on a unity government and amendment of an Islamist-drafted constitution that has polarized the nation. People took to the streets in several cities on Friday in a show of opposition to Morsi and his Muslim Brotherhood after last week's deadly unrest across Egypt, the worst since Morsi was elected in June. Port Said accounted for most of the almost 60 people killed. Violence erupted there after 21 local supporters of a soccer club were sentenced to death on January 26 over the killings of 74 people in post-match violence.